Customer Testimonial: I am 53 and I love the skin polish. It makes me look years younger. It softens the fine lines, and plumps my face. It is amazing. I bought a set for my BFF. I want everyone to know how wonderful your product is. Skin Polish - Full 8.8 oz. Effective on tough knees, elbows and feet! 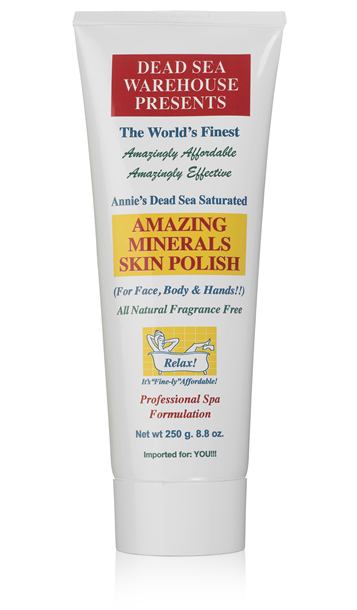 Say "Goodbye" to drippy slippery oil-leaking-everywhere scrubs and say "Hello" to Annie's soft, creamy, easy-to-apply All Natural Dead Sea Warehouse "Amazing Minerals" Skin Polish! Organic Jojoba Oil, Softening Wheat Proteins, an herbal extract of Marigold & 100% Dead Sea Salt grains (which melt during use in the shower, protecting you from over-polishing skin damage) leave your skin clean and silk soft, exfoliated and re-mineralized! Over a year in development, Annie is ecstatic with the results and the ease of application. And, of course, with the all natural ingredients, too! 8.8 oz. tube.